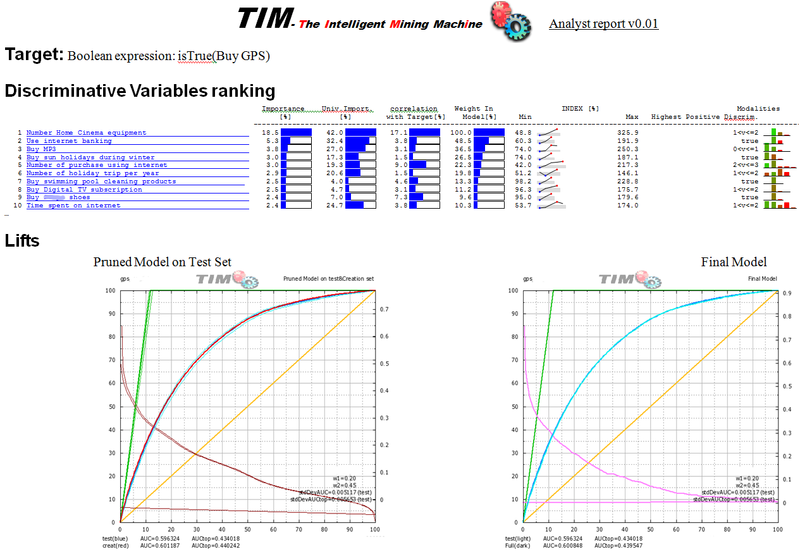 The objective here was to predict if somebody will buy a GPS device: Here above, you can see a screenshot of a standard Analysis report, automagically generated with TIMi. This predictive analysis report accurately describes the "portrait" or "profile" of the "GPS device buyer". "Number of Home Cinema Equipment"
"Number of purchase using internet"
Out of this report, we can conclude that it appears that the typical "profile" of the "GPS device buyer" in 2007 had a very strong technical background (don't forget that this model was built in 2007: the "profile" might have changed now). Interestingly, in 2007, one famous company (that is still selling GPS devices noawadays) made a marketing campaign where you could see, on the television, a spot with a "Robinson Crusoe" kind of man, with a long beard, coming out of the wood saying: "I found civilization back using my GPS!". This television spot was obviously a poor choice because of the nature of the typical "profile" of the "GPS device buyer". In 2007, a television spot involving a more technical, IT person would have been a better choice. accurate predictions AND accurate "Business-Insight". Next: Predictive Accuracy = Money. How so?